About four weeks ago a large branch fell on me while I was gardening, hitting the top of my head hard. I didn't black out but I felt like my head was ringing with the impact and I now know people don't jest when they say they are "seeing stars". After several weeks and large numbers of paracetamol tablets the headaches have started to ease, but for the last few weeks it has seemed that all I wanted to do was to sit in one place and gaze vaguely at a piece of knitting that hardly seemed to grow. Well, the body knows what it is doing and I did find myself just resting in my favourite chair gently dozing and doodling with stitch charts and that seemed to do the trick. Then one day this week, I woke and felt better. Isn't it funny when that happens? So I looked at the few inches of baby blanket I had completed in several weeks and two days later it was done and a second smaller dolly blanket was well on its way. 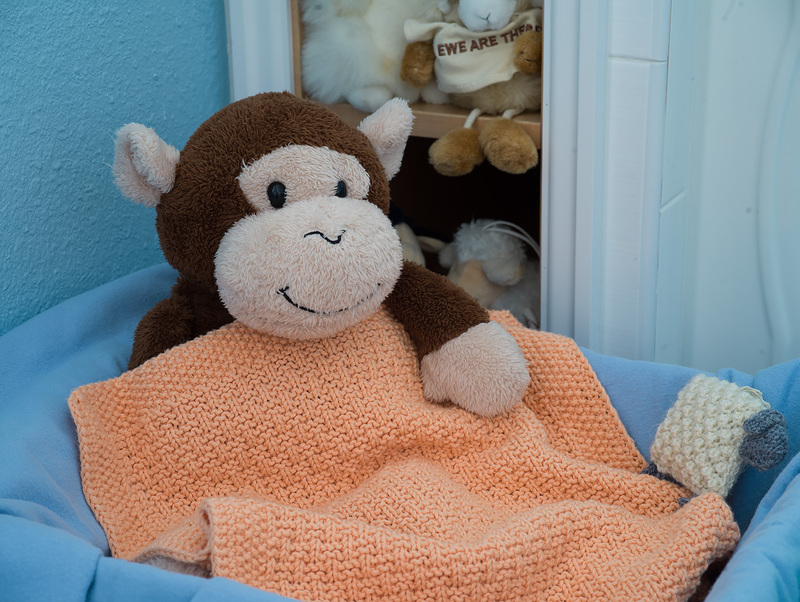 I had fun when I came to finishing the blanket though, as I had a large fluffy helper! Our grandson has a little monkey, Michael, who waits patiently for his next visit. He is a helpful monkey and tried to assist with sewing in the ends but I had to redo them as he got bits of fluff sewn in. Then he examined various boxes to see which would make a good bed before settling down in a medium-sized Amazon box which was just the right size. The stitch pattern is one that I "designed" during my long sessions sitting in my La-Z-Boy chair recuperating. I love doing this – just starting with a blank sheet of graph paper and noodling around with stitches. 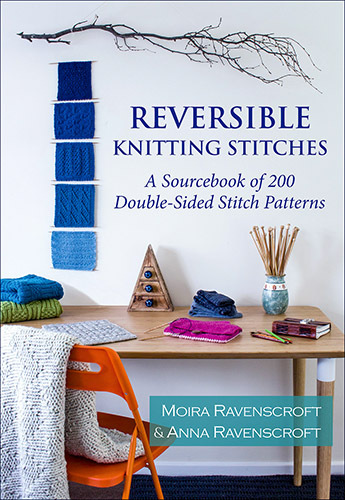 Many of the stitches in our Reversible Knitting Stitches book resulted from just such a process. Of course, if I go hunting I will often come across very similar ones in some stitch book or other. It's hard to invent anything new in knitting isn't it! Well, one of the ones that I drew up really excited me as soon as I was working it. The front face has a very modern feel with sharply-defined lines and the fabric had a pleasing weight. 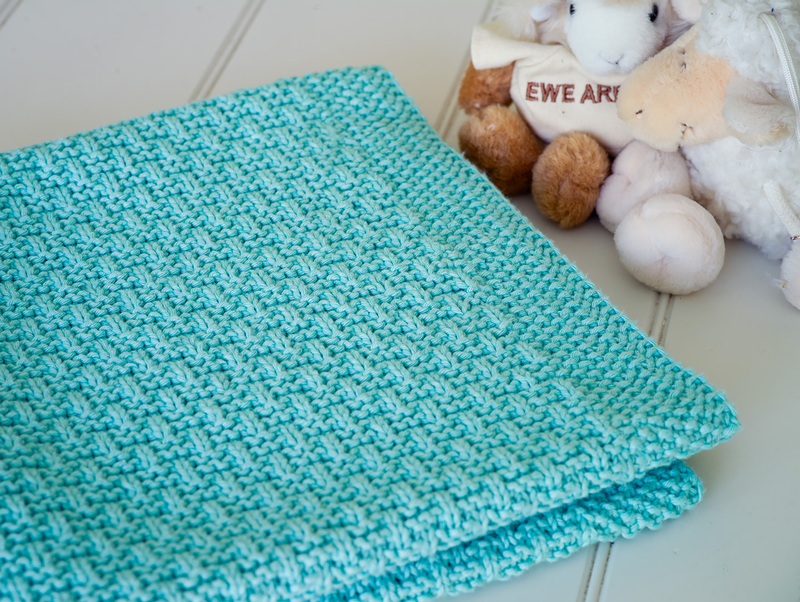 So I tried it in some PaintBox cotton aran yarn and I really liked the way it came. Just perfect for Spring-time babies. The back of the stitch is like an undulating garter stitch with a regular repeating diagonal pattern. Of course, it's those undulations that make a blanket cozy and warm as they really trap the air and give a lovely warmth to the final design. Spring can be very fickle. One minute it's warm like summer and the next you have to bundle up because there's another flurry of snow. So this is perfect for these changeable conditions. Warm enough for a bit of a chilly day but not stifling like a heavy wool blanket would be. 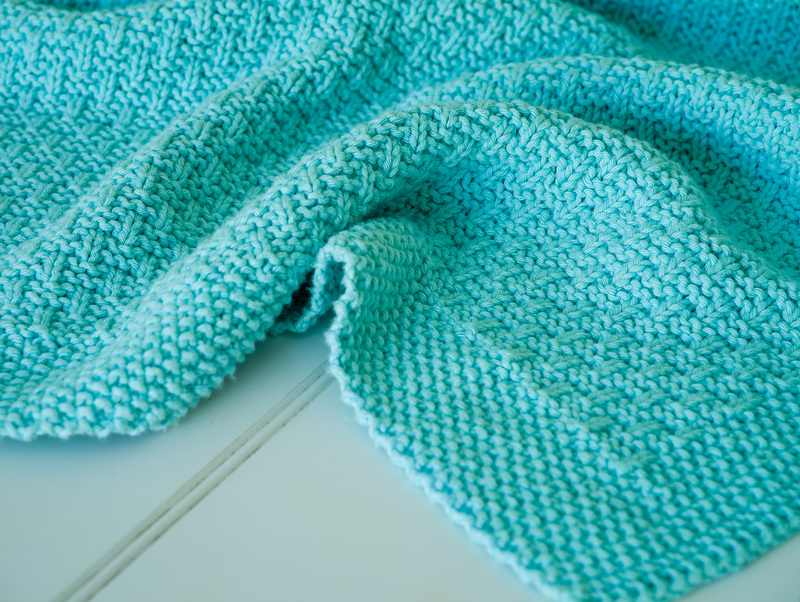 This is the Caela Baby Blanket and Dolly Blanket and the pattern is now available on my website. In addition to Michael's cute little dolly/teddy blanket, the baby blanket comes in three sizes for a Moses Basket, a stroller or pram, plus a large square blanket which would be good for a playpen or playmat. By the way, did you know that the new advice is for babies not to be left unattended in cots with a blanket or soft toys? This is quite different from when I was a young Mum, of course. 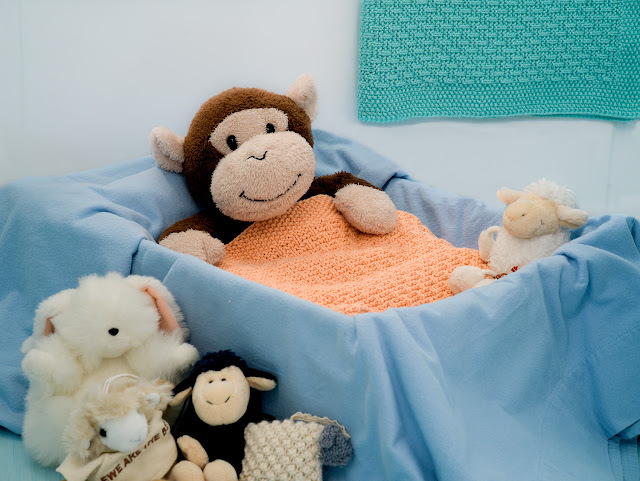 Then you had to put a rolled-up blanket behind baby to keep them on their side, plus quilted bumpers on every side of the cot. Such a change to the bare cots you see today. 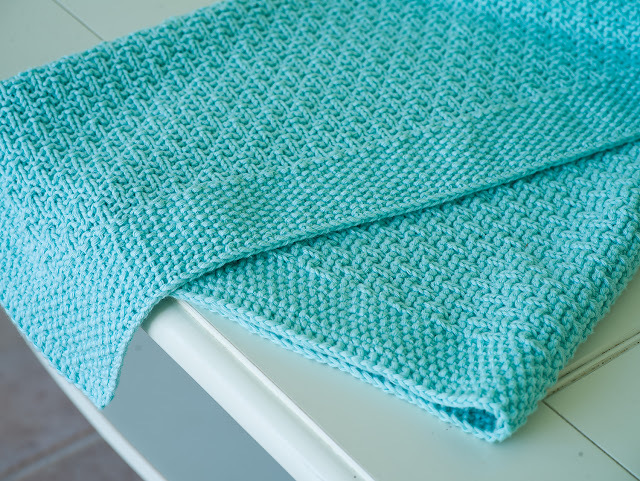 However, when they're out and about with you in attendance, then they definitely need a blanket and this one is great for those times. Sitting in the garden with baby in a Moses basket beside you, strolling through the leafy lanes for a morning walk in their pram or tucked up in the car seat when you are heading to the shops. 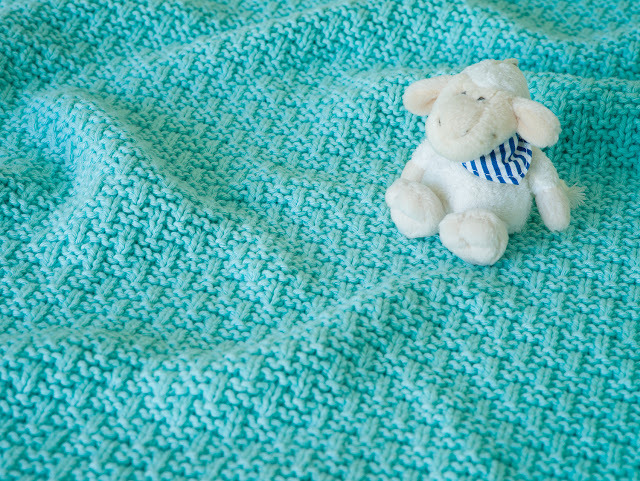 Read more about the Caela Baby Blanket and Dolly Blanket here, and if you have a new little baby arriving in your family soon – many congratulations!